Our daughter Adalynne is wearing the costume. She is not your average kid, especially considering she only 3 1/2 yrs old. She's obsessed w/ Halloween & it's been her favorite holiday since birth. Most kids talk about xmas/bdays all year...our daughter talks about Halloween all year round. We've been doing the countdown since October 1st. She doesn't go for the princesses or girly costumes when it comes to Halloween. 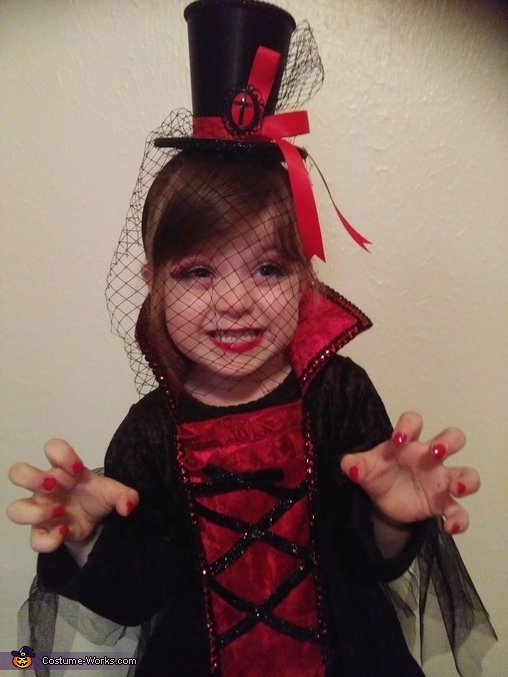 She chose the cutest tiny witch costume last year & this year she chose to be a Vampire Girl. She loves the old time beautiful style Vampire & fell in love with the Victorian Style Vampire dress when we found it. Her dad found the hat, which added to the dress perfectly. We painted her nails red & put black & red glitter eyeshadow on her to complete the costume. She got a million compliments & definitely ruled Halloween night!